Designed and Manufactured For Your Specific Vehicle! 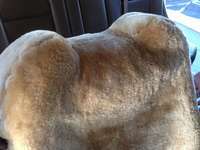 For A Free Luxurious Tailor-Made Australian Merino Sheepskin Seat Cover Quote Designed and Manufactured For Your Specific Vehicle! 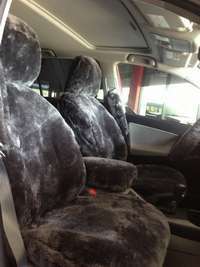 The best way to protect your seats while adding an extra measure of comfort is with sheepskin seat covers. Use them for auto / truck / SUV, motorcycles, golf carts, airplanes and more. 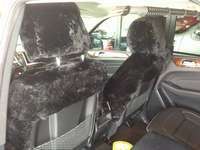 Our premium Line sheepskin seat covers keep you warm in the winter and cool in the summer! 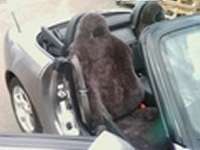 We offer both tailor-made and ready-made sheepskin seat covers with many colors and options to choose from. The finished product fits like a glove and will provide you with years of comfort and luxury. 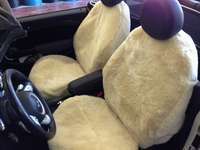 We offer a full Line of tailor-made sheepskin seat covers. Each Tailor-made seat cover is manufactured to the specific Year, Make & Model of your vehicle using plush, 1" thick Merino sheepskins. Our tailor-made seat covers are then secured to your seat using a durable loop design, elastic strapping system and, as an added touch, each tailor-made sheepskin seat cover is finished with a rich looking 1" binding and high grade nickel plated hook . 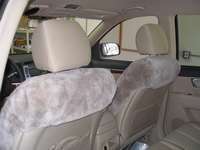 . . ensuring the best fit, highest quality and longest seat cover life available. Choose from 13 luxurious colors all with a manufacturers backed craftsmanship full warranty! 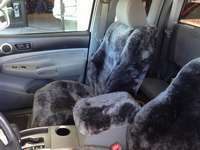 Sheepskin seat covers are great for any season. They keep you cool during the summer and warm in wintertime, because of the breathing properties of wool's hollow fibers. They are always comfortable because they are extremely soft, and they provide a comfortable cushion of air that acts as a temperature insulator. 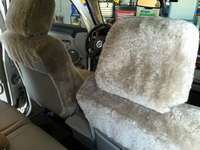 With sheepskin seat covers, you will not have to worry about getting into a "hot seat". During cold winter months, sheepskin seat covers are perfect for giving you that extra added comfort and warmth. 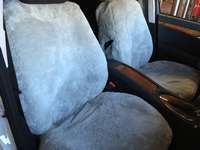 Moreover, while your seat covers are protecting you, they will add resale value to your car by protecting your expensive upholstery from wear and sun damage. 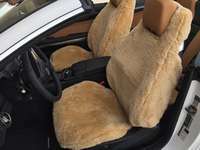 The natural lanolin in sheepskin will actually improve the durability of leather seats over time; making sheepskin seat covers a great investment. Sheepskin will not give off an electrical charge. 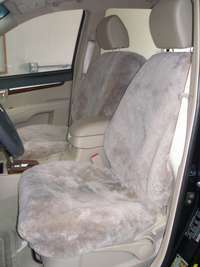 Synthetic seat covers are a 100% insulator of electrical energy. All natural sheepskin is a partial insulator providing you undisturbed release of static electricity created by the natural friction of your body and the environment. Sheepskin is able to absorb sweat immediately and can submit it into the air seven times faster than synthetics. Sheepskin against the body activates the blood circulation and the immune system supporting the relaxation and regeneration of the body. Sheepskin is gentle on your skin because it contains lanolin, a basic substance similar to that found in human skin. Sheepskin helps heal sensitive or inflamed skin or rashes. Sheepskin is dirt and bacteria resistant. It has been known for centuries that the lanolin in natural sheepskin provides it with a self cleaning quality when the sheepskin is hung in fresh air. Based at the Scottsdale Airpark we also serve all of Phoenix, AZ and surrounding valley communities so call 602.524.0807 or contact us for Luxurious Tailor-Made Australian Merino Sheepskin Seat Covers Designed and Manufactured For Your Specific Vehicle! 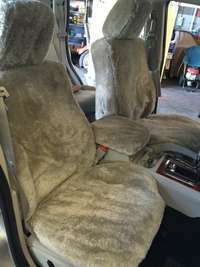 Serving Scottsdale, Phoenix, North Scottsdale, Tempe, North Phoenix, Cave Creek, Carefree, Paradise Valley, Fountain Hills, Arizona with Luxurious Tailor-Made Australian Merino Sheepskin Seat Covers Designed and Manufactured For Your Specific Vehicle!